AFC - 01/31/14 Croatian MEP's Pledge! 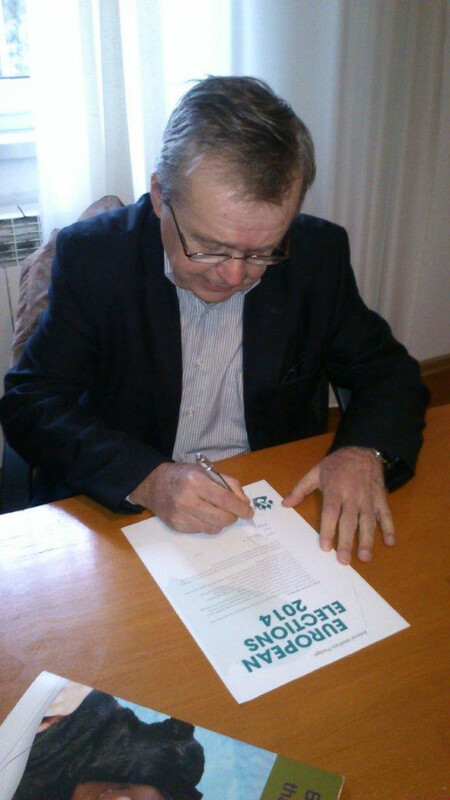 01/31/14 Croatian Members' of the European Parliament Pledge! Following Sandra Petrovic Jakovina and Tonino Picula, Marino Baldini and Nikola Vuljanic also proved their devotion to animal welfare in their future work by signing the Animal Welfare Pledge. International Animal Friends coordinator recently met with Croatian representatives in the European Parliament in Brussels, familiarizing them with the organization's work and introducing them to the current Eurogroup for Animals campaign. Animals Friends welcomes the interest that our representatives show for animal welfare as well as the announcement of offering their signatures to the principles stated in the document of the Pledge. The goal of the Eurogroup for Animals' campaign is to make animal welfare a topic that encourages citizens to vote in elections and to initiate changes. Eurogroup for Animals is a union of European associations dedicated to animal welfare and animal rights that has managed to gather over 40 member organizations throughout its thirty years of action, and the importance of their work as a leading animal welfare organization has been recognized by the European Parliament and Commission. Our representatives are also familiar with the European Vegetarian Union's campaign, Animal Friends being one of the members, whose goal is to harmonize the standards of labelling vegetarian and vegan food at the European Union level. Animal Friends would like to thank Croatian MEP Biljana Borzan for supporting this initiative. Standardized labelling of vegetarian and vegan food makes it much easier for consumers who choose such products based on moral, ethical, religious, health or other reasons.